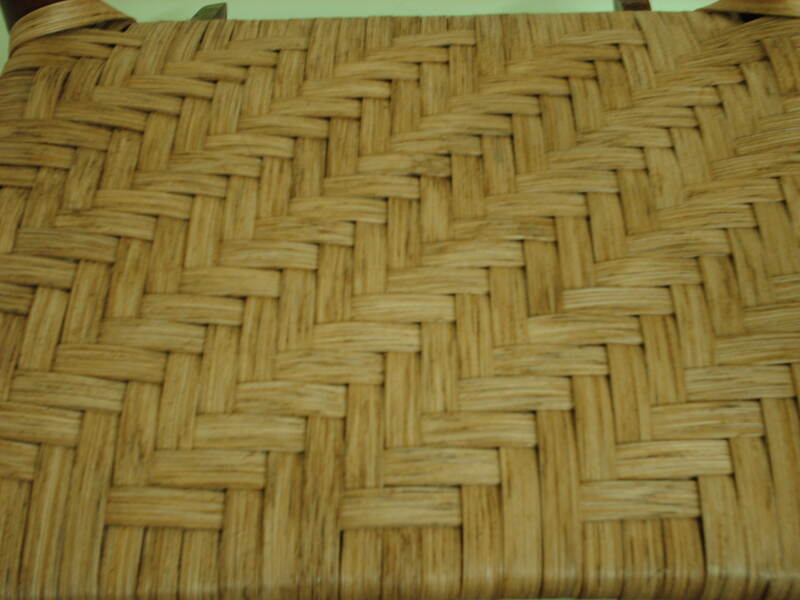 You will be able to find more details on each style of seat –weaving on the SEAT WEAVING PAGE. Hand Caning – In hand caning or hole to hole caning you hand weave the entire seat, with strands of chair cane from 1-2.5 mm wide, depending on the chair this can take from 4 hours to 10 hours per chair. 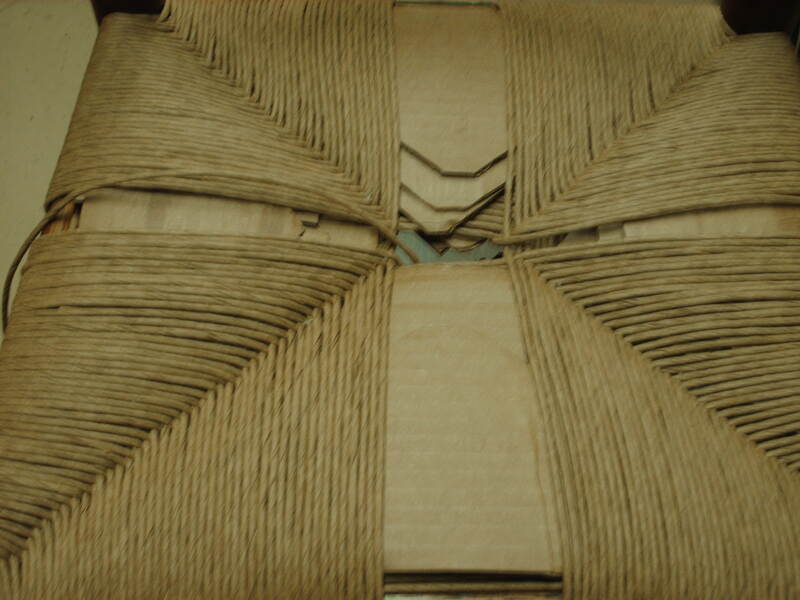 Pressed cane – is a sheet cane that is pre woven on a loom machine however all the diagonal strands must be woven in by hand so the process is not entirely mechanized, it is cut to size and stretched and glued into a groove or channel cut into the perimeter of a a hole in the center of the chair and held in place by a spline generally make of hard reed, much like replacing a screen. Danish Cord – A very tightly woven off white paper, from Denmark, which is vastly different from the fiber rush below. Danish Cord is so tightly woven it does not even feel like a paper, it feels more like a stiffer rope or cordage. Danish Cord can be used in other types of seats which I have not done but seen beautiful end results from using it in place of fiber rush in chairs and on foot stools and bar stools. Danish Cord has a wrapping technique far different from any other technique around, it uses shiny metal “L” nails as many as 144 per chair on the underside of the seat, the cordage is wrapped in a unique pattern on the L nails and makes for a truly strong and long wearing seat. 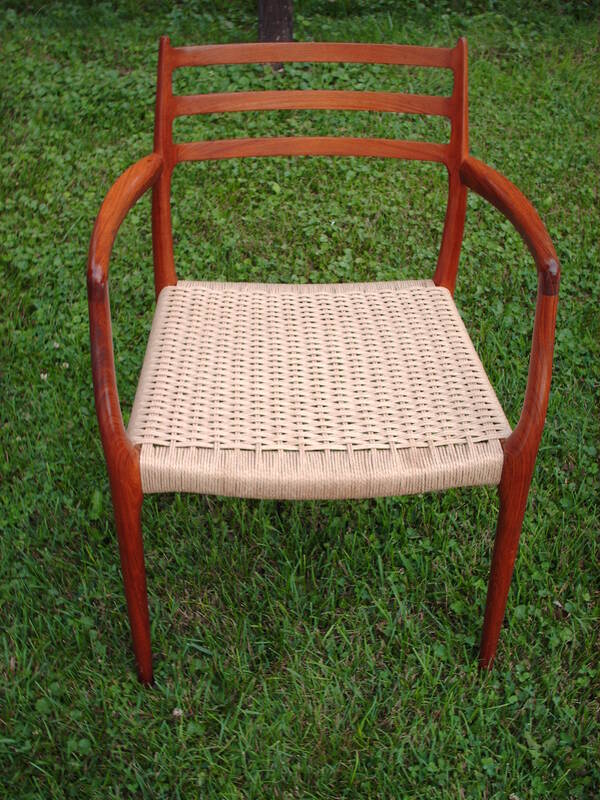 Danish Cord is widely used in Danish Modern furniture from around the 1920’s most notably by Hans Wenger, in his chairs and furniture which as you can see a Hans Wenger chair below is known for his modern and very graceful lines in his work. Hans Wenger chairs are highly prized and sought after of the Danish Modern furniture. Splint bottomed chairs commonly found old oak kitchen chairs, in past decades and centuries we done in a variety of hardwoods such white oak and hichory, today these a still available however are very costly as they are still hand split, thus time consuming to produce, and costly to purchase in a state ready for seat replacement. Today the most common material for this is reed, I use 3/8” flat, a strong reed, but narrow enough to give great defintion in the 3/3 herringbone twill pattern, each seat is packed to minimize wear on the rails, and to give greater comfort to your bottom. 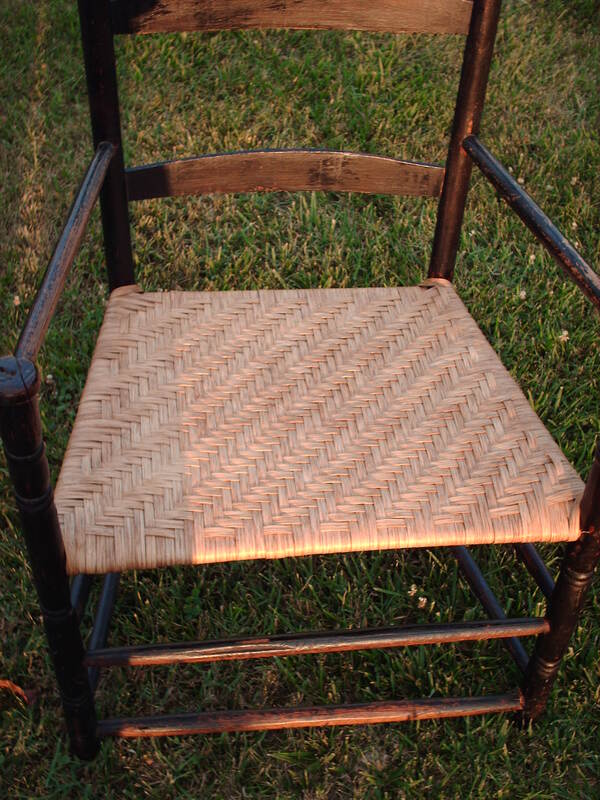 Binder Cane (Porch Cane) is like chair cane used in hand caning, however it is generally thicker and heavier, wider as it comes in 4mm, 5mm, and 6mm widths, generally you will see this on what is known as porch rockers. 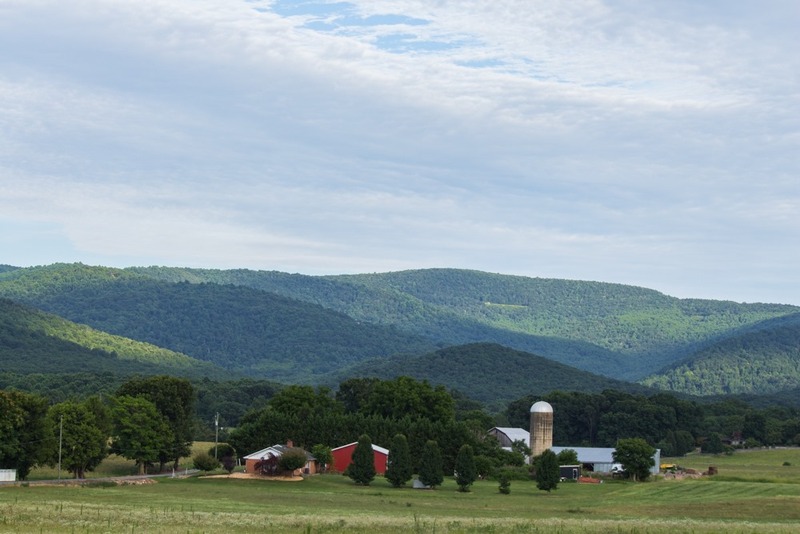 This does not mean it is impervious to the elements nor effected by UV rays, it should be treated as an indoor material. 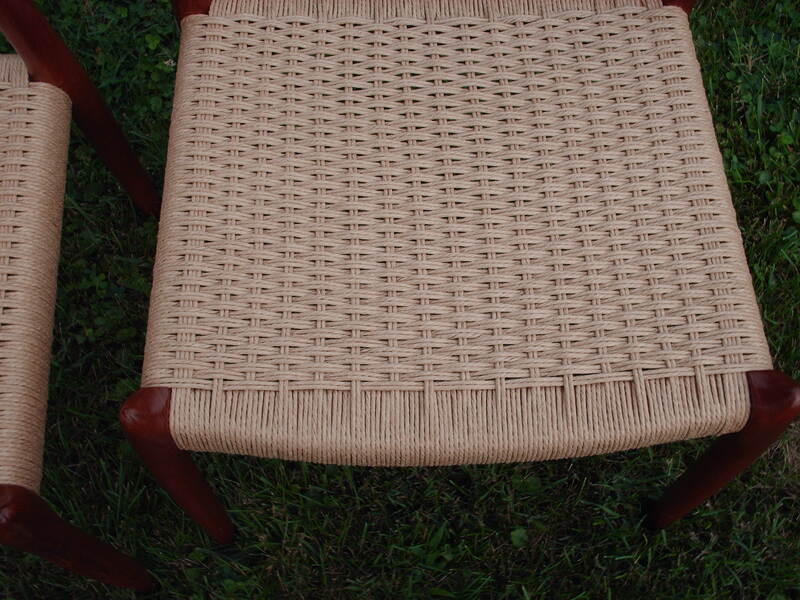 Porch rockers in the day was just that, as binder cane does have the ability to shed moisture on the top surface, is slicker and harder, the weave is tight. however I repeat in the modern era it should be treated as an indoor material. The seats on porch rockers are packed the same in my studio as the splint bottoms above. Fiber Rush is a tightly twisted paper rush that depending upon availability generally comes Kraft Brown, & Golden. Pre-twisted European Rush, is a pre-twisted real rush, however it differs from Genuine Rush, which is very time consuming and is generally reserved for use on museum quality chairs, genuine rush also has a season and is more difficult to obtain. 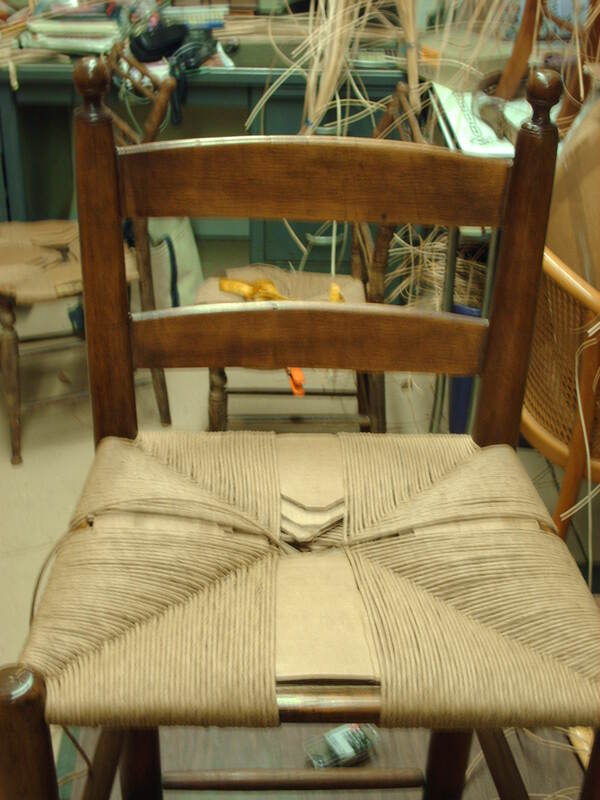 Fiber replacement seats are used in antique chairs most often seen in oak, however there have been other chairs, in which there is a square or round hole in the center of the seat, where not holes around the perimeter or channeled groove is, which in those cases would indicate a hand caned or pressed cane seat. The chairs with just a large hole were made for at the time genuine embossed leather seats. (which are still available) however in most cases today are replaced with embossed fiber medallions. The pictures below are trimmed out around the edge that you see, the medallions are coated with up to 4 coats of shellac, and then closely set around the perimeter with brass hob head oxford tacks. This makes a very impressive seat !